You are currently browsing the tag archive for the ‘State of the Union’ tag. Tomorrow, I hope to feature a detailed post on President Trump’s second State of the Union (SOTU) address, which he delivered to both Houses of Congress on Tuesday, February 5, 2019. This is contrary to the Democrats wanting to legalise abortion in various states up to birth. This is now possible in New York. Some call that late-term abortion, some call it at-birth abortion, and others of us call it infanticide. The day after Trump’s SOTU address, an interviewer from The Daily Caller asked Speaker of the House Nancy Pelosi (D-California) what she thought of the president’s stance in wanting a ban on late-term abortions. I’m not sure all of that quite makes rhetorical sense, but, despite the word salad, it’s pretty clear she’s against. Like many of today’s Democrats, both Pelosi and Manchin are nominal Catholics. Their views on abortion and Planned Parenthood go against Church teaching. Interestingly, in 2018, Church Militant featured a profile of both Manchin and his Republican opponent — also Catholic — Patrick Morrissey, described as being ‘100% pro-life’. Manchin holds some contradictory positions. Could he, a former governor of West Virginia (2005-2010), be having a change of heart? Meanwhile, Speaker Pelosi’s position on the matter seems to be more mainstream among today’s Democrats. On January 31, I posted on President Donald Trump’s first State of the Union address. If you haven’t read that and haven’t followed the SOTU, especially the Democrats’ non-reaction, please do, as this post is a follow up looking at reactions from both sides of the aisle. 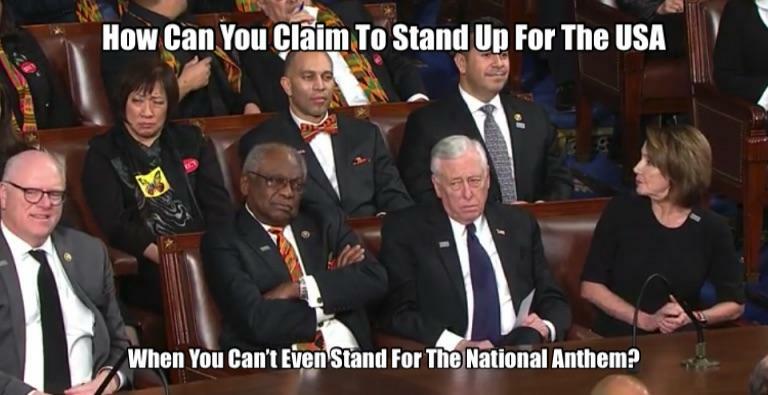 During the SOTU, the Democrats — bar one or two — sat in silence. There was only one time when a number of them stood and applauded. No one expects them to applaud Trump’s policies, but when a president praises Americans, the custom is to stand and applaud.
.@realDonaldTrump’s #SOTU performance last night was just that — a performance completely devoid of the serious policy ideas that lead to real bipartisan efforts. I’m a Democrat. But I disagree with you. We have an opportunity to come togeather. It’s limited: But we can if we want too! Let’s do it! We can embrace change and still stick to our values! When you look at Trump’s address, note how many times he said ‘we’ and ‘together’. He listed all of his administration’s huge achievements made in just one year. Watch the video and see that this was the one time a large number of Democrats stood and applauded. Ironically, that’s when Gutierrez made his exit. Words fail me, so I’ll move on. The media’s reaction was just as unhinged as the Democrats’. Some took issue with Trump for wanting to fully eradicate MS-13, saying we cannot even be sure if this horrific gang actually exists! Unbelievable! Yet, people still tune in to this rubbish! At least Matt Drudge’s headline said the president has ‘shows heart’. Hey, Dems, take a look at yourselves. Then take a look around you. Make no mistake: Democrats didn't brand themselves as anti-Trump tonight. They branded themselves as anti-American. I get it that the Dems are not exuberant listening to @POTUS but it will be hard to explain to voters why they sat still when @realDonaldTrump said we shouldn't give $$ to countries who show contempt for us. As an African Amerian single mom of three young men, I was so hurt and so PISSED to see how the Democrats treated those parents. Despicable. I will NEVER forget that. I wish I could tell her how much good company she has in being red pilled. So many black Americans stay on the Dem plantation because they fear their community will abandon them. Alone and adrift in a world where they were taught that all are turned against them, especially whites. Once people like this lady figure out they’ve been lied to and used and want to leave, they end up going up against the “social enforcers” who use their power within the black communities to isolate those who think differently. To repeat, I wish I could tell her what wonderful company she has here. Trump’s black support has already doubled in a year. It’s my belief that a lot of blacks are actually open to him, and all they need is a reason to switch over. This image could be broadcast strategically for a few weeks during the election and probably win over tons of black voters. I’m doing a lot of laughing at the Dems these days. They are circling the toilet bowl and they know it. Bitter clingers to very bad ideas. All of these Dem photos and film clips can be put together in a powerful campaign ad this year for mid-terms and again in 2020! Another thread said that the SOTU has finished the Democrat Party. I refuse to say ‘Democratic’ — the proper name — because their members are too radical to live up to it. Not even rigged voting machines can save these desperate individuals now. For years, I have longed to write that sentence. Now I’ve finally been able to do so. This image comes courtesy of The_Donald. Can’t you see this being used to great effect? Trump touted the patriotism of a young boy named Preston who planted flags for veterans. Republican side stands and applauds. Dems do nothing. Nancy Pelosi looks round to make sure. It is no doubt higher than that, but polling companies don’t care to get the correct weighting for Republicans and Independents. One thing is certain: 2018 will be exciting, especially when the mid-term campaigning starts. President Donald Trump gave his first State of the Union address on Tuesday, January 30, 2018. Last year, he gave a presidential address to both houses of Congress on February 28. The format was very similar to the State of the Union address. The White House site has a transcript. Stephen Miller, his speechwriter, did a formidable job once again. Miller is highly inspirational. Most of President Trump’s speech follows. I have interspersed it with tweets of text and reactions, especially from Democrats. Beforehand, Trump welcomed his special guests privately in the Oval Office. He mentioned all of them in his address. They were ICE Homeland Security Investigations (HSI) Supervisory Special Agent Celestino Martinez, Coast Guard Petty Officer Ashlee Leppert for her work during Hurricane Harvey, Staff Sergeant Justin Peck who rushed to save an officer stricken by an IED blast in the Middle East, police officer Ryan Holets and his wife Rebecca for adopting a baby born to a drug addict, three employees from Staub Manufacturing to highlight the new tax plan, two sets of parents who lost children to gang violence, Otto Warmbier’s parents who suffered deeply after their son needlessly died shortly after returning from North Korea, Ji Seong-ho who also suffered at the hands of the North Koreans, firefighter David Dahlberg who rescued 60 children from a California wildfire and 12-year-old Preston Sharp who has organised the decoration of 40,000 veterans’ graves with American flags and red carnations. including 200,000 new jobs in manufacturing alone. After years and years of wage stagnation, we are finally seeing rising wages! From their reactions, it's clear that Democrats are unhappy about rising wages and lowered unemployment.
.@POTUS: "This is our new American moment. There has never been a better time to start living the American Dream." So to every citizen watching at home tonight — no matter where you have been, or where you come from, this is your time. "Let's all come together and work together"
Here tonight is Preston Sharp, a 12-year-old boy from Redding, California, who noticed that veterans’ graves were not marked with flags on Veterans Day. He decided to change that, and started a movement that has now placed 40,000 flags at the graves of our great heroes. Can you hear me now @nfl? "People who are terminally ill should not have to go from country to country to seek a cure. I want to give them the right to try." Some Democrats were booing Trump's comments on illegal immigrant gang crime right before he told the horrific story of a family in the room. Wow. The next topic was immigration. Trump explained that his plan has four pillars: 1) an amnesty for 1.8 illegals whose parents took them to the US at a young age, 2) the wall and more border agents, 3) an end to the visa lottery and 4) an end to chain migration. I am asking the Congress to pass legislation to help ensure American foreign-assistance dollars always serve American interests, and only go to America’s friends. Otto’s Parents, Fred and Cindy Warmbier, are with us tonight — along with Otto’s brother and sister, Austin and Greta. You are powerful witnesses to a menace that threatens our world, and your strength inspires us all. Tonight’s speech just became the most Tweeted #SOTU or #JointSession address ever, passing last year’s record of 3 million Tweets. For now, it is easy to see why Trump won the 2016 election. He really does care about Americans and America. THIS is the man Democrats want to impeach? It makes no sense other than to people who are sick in the head. More on the Democrats on Friday.